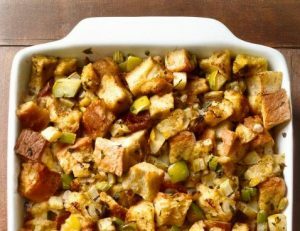 With Thanksgiving around the corner, the pressure is on to get that stuffing done right! And this year, we want to help you shine with an easy peasy recipe. 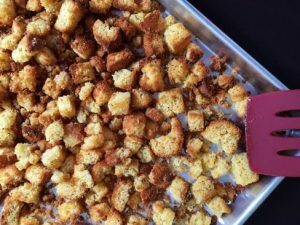 To do so, we’ve come up with a delicious recipe and best of all super easy to make. 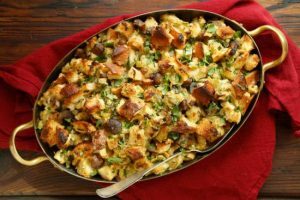 So prepare to wow your guests and family because with this thanksgiving stuffing you will surely become the star of the kitchen. When it comes to the bread, you can either toast it in the oven or you can leave the bread out overnight, uncovered, so that it dies out a bit. Melt 1 stick butter in a large skillet over medium heat. Add 2 cups each diced onions and celery, 2 chopped apples and 1 tablespoon each minced sage and thyme; season with salt and pepper and cook 5 minutes. Add 3 cups chicken broth and bring to a simmer. Whisk 2 eggs with 1/4 cup chopped parsley in a large bowl; add 16 cups cubed stale country white bread, then pour in the vegetable-broth mixture and toss. Transfer to a buttered 3-quart baking dish and dot with more butter. Cover and bake 30 minutes, then uncover and bake until golden, 20 more minutes.